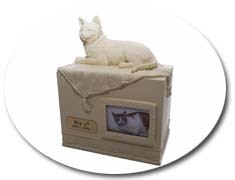 The urn you choose serves as a permanent and final home for your treasured pet. 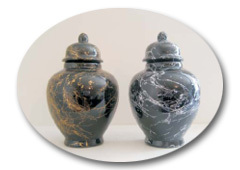 Our exclusive and unique selection of urns allows you to eternally honor your friend, and we have sourced out beautiful tribute urns for all budgets and personal tastes. 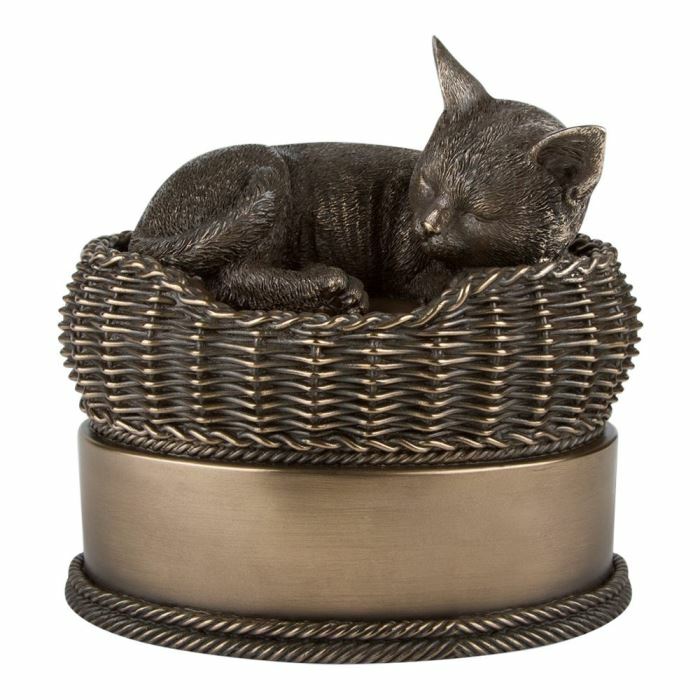 These handcrafted, ceramic pet urns are environmentally friendly and contain no lead, so they can be safely buried. 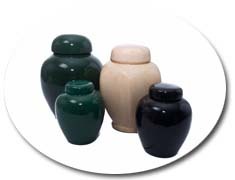 Urn size is determined by the size of your pet, and you can choose from these colors: Black, Jade, Café au lait. Engraved plaque with your pet’s name additional charge. 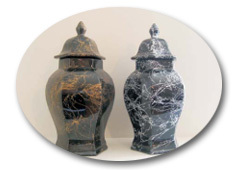 Ceramic urn in marble finish. Available in the following choice of colors. 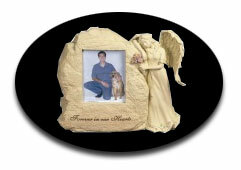 Engraved plaque with your pet’s name additional charge. 1. 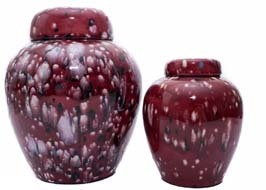 Burgundy Extra Small - 3.5" x 2.5"
2. 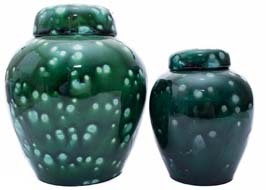 Emerald Green Small - 5" x 4"
Extra Large - For pets over 110 lbs. 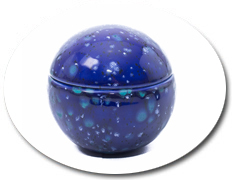 A ball shaped ceramic urn. 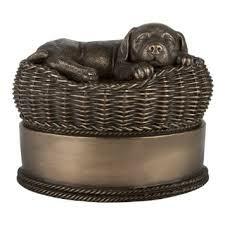 For pets up to 15 lbs, size 3.5" x 3.5". Engraved plaque with your pet’s name additional charge. Colours: Forest Green, Jade Green, Off-white, Café au lait. $45. Special order in marbled finish. $52. 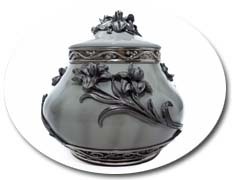 An exquisite Rose Bowl theme ceramic urn. For pets up to 15 lbs, size 3.5" x 2.5". Engraved plaque with your pet’s name additional charge. 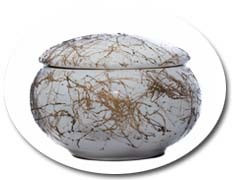 Special order in marbled finish. Cat Angel in grey stone ceramic finish, 6" x 8". Engraved plaque with your pet’s name additional charge. $95. Dog Angel in grey stone ceramic finish, 6" x 8". Engraved plaque with your pet’s name additional charge. $95. 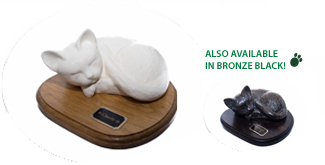 Sleeping ceramic cat - colour white on a golden oak base, colour black bronze on ebony base. Engraved plaque with your pet’s name additional charge. $115. For large pets up to 175lbs. Engraved plaque with your pet’s name additional charge. For pets up to 35lbs. Engraved plaque with your pet’s name additional charge. For pets up to 80lbs. 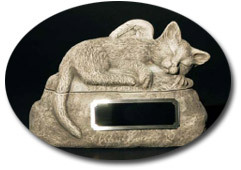 Engraved plaque with your pet’s name additional charge. This beautiful Angel rests her head and watches over your beloved companion. 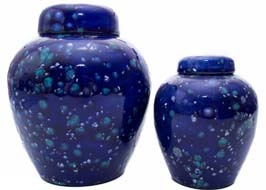 Ceramic urn is engraved with "Forever in our hearts". 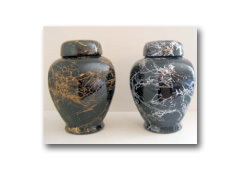 Urn size: 9" X 11" x 5"
Photo size: 5" x 3 ¾"
Your faithful friend will always be close to your heart. Treasure the time you shared and keep your memories close. 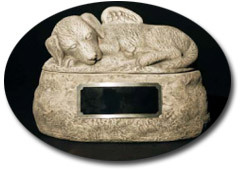 Urn size: 7 ½" X 6 ¼" X 4 ½"
Photo size: 1 ¾" X 2 ½"
Exquisite polystone urn, adorned with pewter flowers. 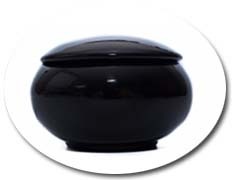 Urn size: 6 ¼" X 7" X 7"
© Copyright 2012 Pet Friends. All rights reserved. Created and maintained by WSI - Montreal website designers.